Best blue chip companies in India. The very well-known stocks are included in the Dow Jones India Titans 30 or Bombay Stock Exchange Sensex index. 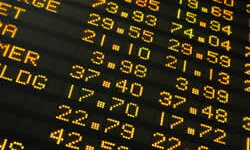 Bombay Stock Exchange, National Stock Exchange (India) market capitalization was $1.6 trillion (Bombay), $1.5 trillion (National) respectively, as of December, 2013. Most liquid stocks are listed on the Bombay Stock Exchange and the National Stock Exchange of India. See more about BSE Sensex blue chip companies. See more about Dow Jones India Titans 30 – blue chip companies. The most prominent sectors in the index are financials, basic materials and oil and gas.